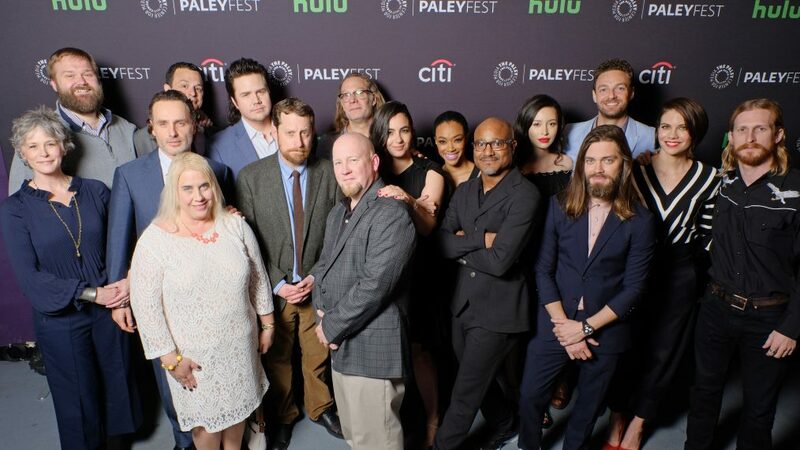 PaleyFest 2017 kicked off on Friday night with a panel honoring AMC's The Walking Dead. With only three episodes left in Season 7, the cast and producers shared tidbits of what's to come before and during the panel. Sunday's episode features a return to the Hilltop. In the March 19 hour, "The Other Side," the series once again returns to the Hilltop community. "[Maggie] has been really intent in creating a safe home and planning for the future and planning their attack," Lauren Cohan (Maggie) told TV Insider. And the hour will shed some insight into how the Hilltop plans to handle their biggest foe. "You can see the decisions they're making in regards to the Negan situation," Tom Payne (Jesus) teased. "Because we've been with all the other groups so much, with Carol and Morgan, you saw with them the turns to [decide] to do something. I think you'll see how the Hilltop are dealing with it." But Sasha (Sonequa Martin-Green) has her own plan—with Rosita (Christian Serratos)—to take out Negan (Jeffrey Dean Morgan). "It's very powerful to see these women come together," Martin-Green said. "Especially given our past. I think that's an inspiring thing, and I think it's a very poetic thing: two women, coming together for this mission." After isolating herself, it took discovering that Negan killed Glenn (Steven Yeun) and Abraham (Michael Cudlitz) for Carol (Melissa McBride) to snap back into fighting mode. "She found out the truth and went immediately to the Kingdom," Gimple pointed out to TV Insider. "She told Ezekiel, 'We have to fight.' That is a pronounced change to that character. She's obviously deeply, deeply impacted, and the way that she's operating is completely different than it had been the episodes before that." But will the change stick? "Stories turn and twist," Gimple allowed. "But who Carol is, she's a pretty determined person. When she needs to do something, she goes ahead and does it." Season 8 will open with a milestone. When The Walking Dead returns for its eighth season, the season premiere will be the show's milestone 100th episode. But the hour will be very much about looking ahead. "It's less about that we reached 100 episodes, and more about the next 100 episodes." Gimple said during the show's Paley panel. "The end of this season is very much the end of a chapter. It's very much a conclusion that promises this epic story ahead….it's about setting up this gigantic epic tale to come." How might The Walking Dead end? Though the end is (likely) not near, that didn't stop a fan and a couple of cast members from speculating how the series—and their characters—might ultimately end during the panel. Andrew Lincoln (Rick) shared his hope that Rick would sacrifice himself in an attempt to save everyone he loves, but, after sustaining a bite and surviving, would discover he could be the cure.